Today , we're gonna start off by telling you guys about the " Bermuda Triangle " . 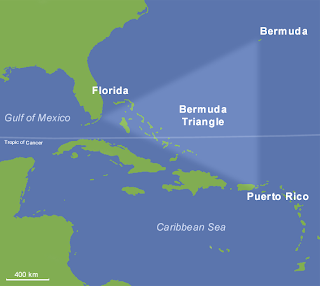 I think most of you guys even world wide knows the story about the mysterious Ships even planes got lost in the Bermuda Triangle . How is it possible ? Ghosts ? Well Melody ... Actually , I watched " Discovery Channel " last time . The story about the missing Ships & Planes have already being discovered . The ship was being hit by strong waves then sank . For the planes , they were found missing in one of the swamps far from the Bermuda Triangle . But yeah , there's still one thing that has not been discover . The magnetic problems . Before the ship sank & the plane crash they reported that the composes weren't working well . It's like there's something in the Bermuda Triangle that stops Magnetic / Electrical objects to work .